Hi everyone! I am excited to introduce to you Wonderful Creations first guest post of the year. Today’s article is written by Kiera Tomlinson. Kiera is a writer and a small business owner based in London. Enjoy reading her awesome DIY tips! Are you sick and tired of carrying a ton of cleaning products and supplies around your home and always forgetting something and having to go downstairs again just to get a simple rag? Or keep dropping and spilling your cleaning products because there are simply too many, and you are tired enough from cleaning to have to go up and down the stairs carrying bottles of cleaning products. Well, there is something that people have created to help us with our daily cleaning work. You must have heard of cleaning caddies, right? Well, they are sold in stores and are very cheap and practical. 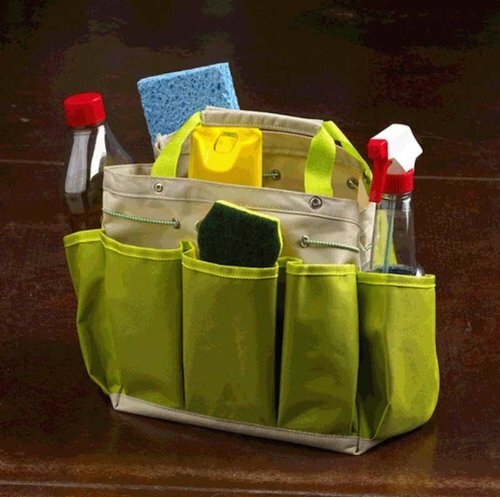 They are designed to fit all of your most used cleaning products and tools, and to carry them around the house easily. But the ones in stores are pretty generic and most of them are plastic. If you want your cleaning caddy to be more pleasing to the eye and bring you joy just by looking at it, and make it personal, so that it reflects you and your personal style, you can try making one on your own. It is very easy, everything can be used as a cleaning caddy. You can use a bag, a bucket, a basket, a cardboard box, plastic container, old shoe boxes, big old plastic pots for plants, just anything big enough to fit all of your cleaning supplies. What you need to do is put separators and divide your caddy of choice into a few compartments. If your caddy of choice is a cardboard box, get another one and cut pieces of it to glue inside and use as separators for your cleaning supplies. If you have chosen a big cloth bag, just sew in a few fabric pieces to make the separate spaces. For decoration of your DIY cleaning caddy you can feel free to use any kind of materials. Of course, it depends on the thing you have chosen to be your caddy, you can paint on it, you can use ribbons, wrapping paper, yarn, whatever tickles your fancy. And if you happen to enjoy making yourself a cleaning caddy, you can easily DIY two or three, make them different, if you have ideas, and use one for each room. Tenancy Cleaners London suggests to make yourself a basket cleaning caddy for your bathroom cleaning tools and supplies; turn a plastic plants pot into a cleaning caddy for your outdoors cleaning tools, etc. Let your imagination run wild and create as many cleaning caddies as you need. There is nothing prettier than a personalised and DIY cleaning caddy. It will give you the boost and confidence you need to give your best to your cleaning. And we all know we need such a boost sometimes. If you are serious with your cleaning caddy you can make a bigger one. A friend of mine had a three-story trolley turned into a cleaning caddy. She had all of her cleaning products and equipment on it and walked around her entire home with it. Get your craft supplies and make yourself some beautiful cleaning caddies. It does not matter if you are going to fill them with home-made or store-bought cleaning products, get your cleaning products, your gloves, sponges, dusters, brushes, cloths, and equip your cleaning caddies. There is nothing wrong in having fun while you are cleaning. Having one or more cleaning caddies will also help you get rid of the clutter your cleaning products and tools probably are in. Make your cleaning easier, DIY yourself a cleaning caddy now, and see for yourself how much easier it is to have one.